Creamy, buttery mashed potatoes are a must at any holiday table. When it comes to favourite comfort foods, mashed potatoes are near the top of my list. They are the perfect side to serve with gravy-based dishes such as turkey and roast beef and no holiday table would be complete without them. The great thing about potatoes (aside from being delicious) is that they are very inexpensive and readily available year-round. I’m from New Brunswick, Canada, which is a major potato-producing region (McCain’s, the world’s largest producer of frozen french fries, is based there). A couple of years ago, I saw a roadside sign near Fredericton advertising 50 pounds of potatoes for $9.99 so it’s no surprise that they were a staple at our dinner table almost every night. Potatoes may not look exciting but they are very versatile. Choose starchy potatoes such as Russets (also known as Idaho or baking potatoes). Yukon Golds also work well and have a nice buttery interior. 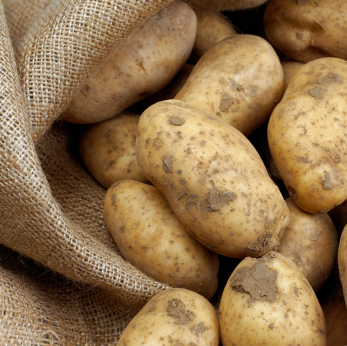 Avoid waxy ‘boiling’ potatoes such as fingerlings or red potatoes. Cutting the potatoes into chunks will speed the cooking process. You can peel them before cooking for a nicer presentation but sometimes I leave the skins on for texture and nutrients. Use a potato ricer to ensure smooth, lump-free potatoes. A potato ricer looks like a giant garlic press and you push the cooked potatoes through tiny holes, resulting in potato strands that look like rice. Ricers are available at most kitchen stores. Do not use a mixer to beat them – they will become gluey. Season well! Potatoes can handle a lot of salt and seasonings such as garlic, horseradish or chopped herbs (see below for more ideas). Be sure to add butter and dairy while the potatoes are still hot so everything melts and combines easily. Add seasonings gradually and taste as you go. Place mashed potatoes in a metal bowl over a pot of gently simmering water. Cover loosely with foil. Stir occasionally and check moisture and seasoning before serving. 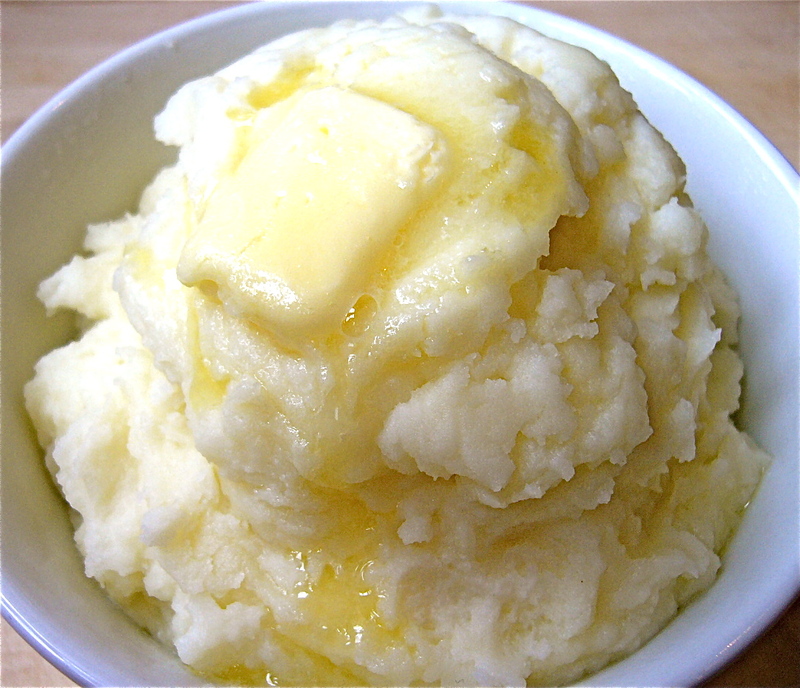 Cooked mashed potatoes can be kept warm in a slow cooker set to ‘Low’. Check and stir on occasion, as they can become dry around the edges. Evaporated milk or regular milk can be substituted for the cream but the results will not be as creamy and rich. In a large stockpot, add potatoes, 1 Tablespoon salt and enough water to just cover the potatoes. Cover and bring water to a boil. Remove cover and reduce heat to medium-high. Gently boil until potatoes are very tender, about 20 to 25 minutes. Check with a sharp knife periodically to determine tenderness. Drain cooked potatoes. Place two or three potato chunks in the potato ricer. Working over a large bowl, press potatoes through ricer. Repeat with all potatoes. Quickly add butter and cream to hot potatoes. Stir until combined and the potatoes are creamy. Add salt to taste. Add any optional seasonings and mix until incorporated. Serve with your favourite dishes such as braised short ribs, roast chicken or turkey with gravy. Roasting green beans with shallots is a fresh alternative to heavy soup-based casseroles. American Thanksgiving is next week and a favourite at many tables is Green Bean Casserole. Made with canned soup and topped with fried onions, unfortunately it’s loaded with calories and sodium. Lighten up with a delicious dish of roasted green beans and shallots, finished with sea salt and a squeeze of lemon. These beans are also vegan-friendly and gluten-free so everyone at the table can enjoy a taste. Even if you’re not celebrating Thanksgiving, they make an excellent side dish for roast beef and chicken. Strictly speaking, green beans are at their peak in the summer, however, they are greenhouse-grown and readily available throughout the year at most grocery stores. Do not use frozen beans as they have a different texture. Tip: When slicing the shallots, be sure the rings are quite thick (about 1/4″) or they will burn before the beans are done. Preheat oven to 475 degrees Fahrenheit. Place the baking rack in the middle position in the oven. 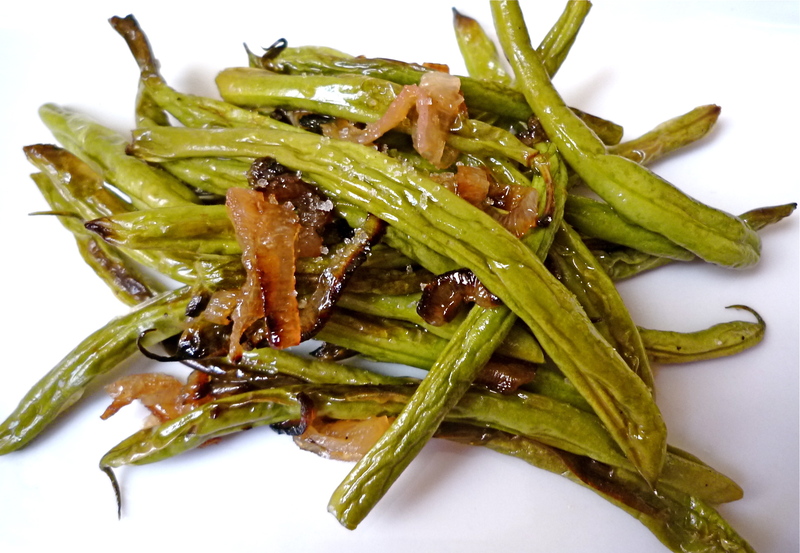 In a large bowl, toss green beans with shallots and oil until they are lightly coated. Cut a piece of parchment paper to the same size as the bottom of a roasting pan or rimmed baking sheet. Line the sheet and pour the bean/shallot mixture onto it, making sure they’re in a single layer. Roast the beans for 10 minutes. Check on them at this point – if the shallots and beans are becoming very brown, remove them from the oven. Otherwise, roast for another 5 minutes until the beans are beginning to char around the edges. To serve, season with sea salt and a squeeze of fresh lemon juice. My brother-in-law Dan is a vegetarian so I’m always trying to come up with interesting dishes so he’ll have something special to enjoy at Thanksgiving and Christmas. I enjoy the challenge and it encourages those of us who eat meat to try some new dishes as well. 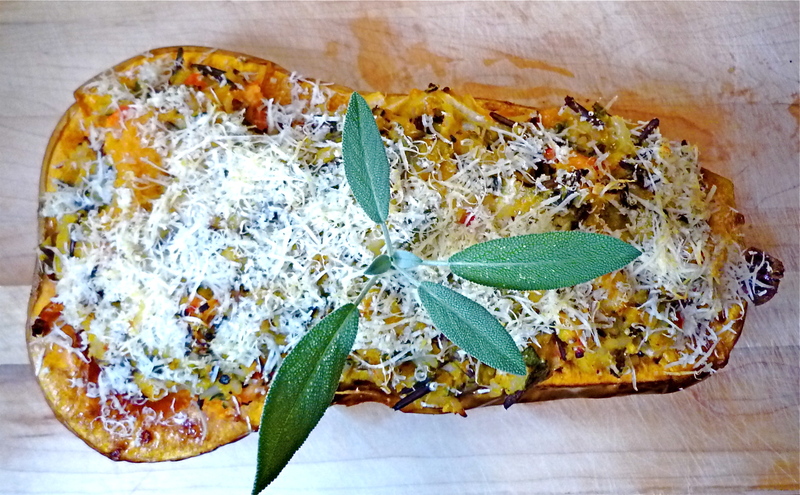 I made this butternut squash stuffed with wild rice and herbs last year and it was a hit. It makes quite a bit so you should have plenty to serve as either a vegetarian main course or as a side dish. It is delicious with pork, chicken or turkey. I can easily be adapted for vegans- just follow the substitutions at the end of the recipe. 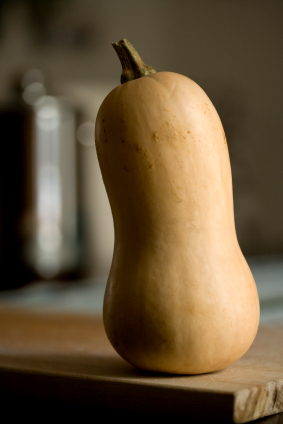 Using a large sharp knife, cut the butternut squash lengthwise down the middle and separate the two halves. Scoop out any seeds and discard. Rub each half of the squash with the oil (1 teaspoon per half). Place on a baking sheet and roast in the oven for 45 minutes or until tender. Check tenderness with a sharp knife – it should be soft enough to scoop out with ease. While the squash is roasting, prepare the stuffing ingredients. In a large saucepan, heat 2 cups vegetable stock until boiling. Add wild rice, cover tightly. Reduce the heat to medium and cook for 15 minutes. Add white rice to the pot and continue to cook the rice mixture for another 20 minutes or until the rice is tender and the stock has been absorbed. In a large bowl, add onion, red pepper, garlic, sage, rosemary and thyme. Once the rice mixture has cooked, add it as well. Remove baked squash from the oven and let cool slightly. Using a large spoon, carefully scoop the flesh out of the baked squash halves, making sure to leave about ¾” of a ‘wall’ intact so the shells will hold together. Add the scooped squash to the rice/stuffing bowl. Stir the cooked squash into the rice stuffing mixture until it is thoroughly combined. Add melted butter and salt and pepper to taste. Scoop the stuffing mixture back into the squash halves. Top each half with parmesan cheese or bread crumbs (1/4 cup per half). Bake stuffed squash for 20 minutes or until the cheese is beginning to brown on top. Garnish with a sprig of sage if desired. Substitute vegan-friendly margarine, olive oil or neutral oil (canola, safflower, etc) for the melted butter. Top with ½ cup fresh breadcrumbs that have been tossed with 2 Tablespoons olive oil. Sprinkle with fresh chopped herbs. Bake stuffed squash for 20 minutes or until crumbs begin to brown. 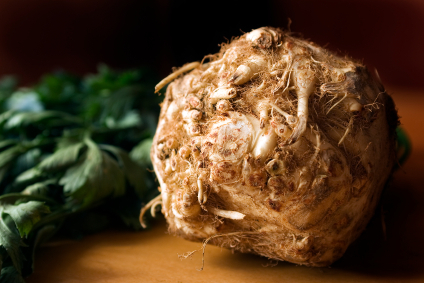 Celery root (a.k.a. celeriac) is a root vegetable with a mild celery-like taste. It is delicious both raw and cooked and it can be a nice alternative to potatoes in a puree or soup. 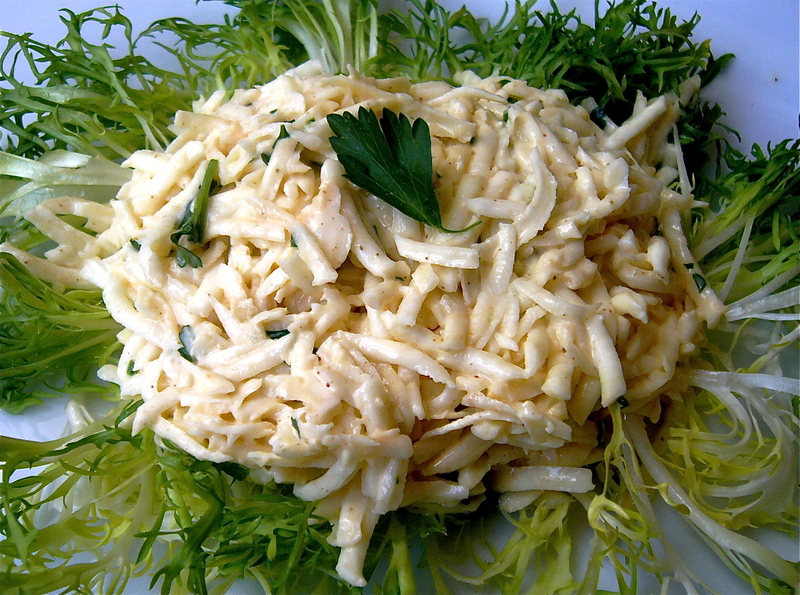 However, I particularly like celery root shredded and mixed with a lemony dressing, making a refreshing cold-weather slaw that is perfect with roast meats. Celery root tends to be quite hard so peeling one requires a sharp knife. To easily peel off the ugly outer skin, slice a sliver off the bottom so the root will stand upright on a cutting board. Using a large, very sharp knife, carefully slice the skin off in a downward motion, working your way around the root (much like peeling a pineapple). Discard the skin. The root can be hand shredded on a box grater, however, I find it’s much easier to do so with a food processor grater attachment if you have one. This salad makes a great side dish to roast chicken, braised short ribs or roast beef. Prepare the salad a few hours in advance so the flavours have time to come together and the celery root softens a little. Cut peeled celery root into 3” chunks. 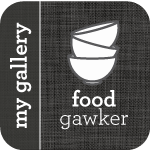 Using a food processor with a grater attachment or a box grater, grate celery root. Place in a large bowl and set aside. In a separate bowl, combine mayonnaise, vinegar, celery salt, sugar, Dijon and garlic. Stir until thoroughly combined. Add mayonnaise mixture to grated celery root. Add chopped parsley and mix until completely mixed and celery root shreds are evenly coated. Serve on a bed of frisee or mixed greens, if desired.